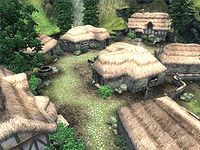 Bleaker's Way is a village with an inn between the Imperial City and Bruma (quest-related). People around town will tell you that the village gets its name from Ulf the Bleaker, the first settler to arrive. Soon after that, Rayno Dalvilu and his family arrived. Descendants of those first arrivals make up the two major families that live in the village: the Ulfgar and the Dalvilu. The heads of each family, Hrol Ulfgar and Nivan Dalvilu, jointly lead the community and have done so for many years. There is an inn here, the Bleaker's Way Goodwill Inn, which offers free beds. Bleaker's Way also appeared in ESO. Esta página foi modificada pela última vez à(s) 04h16min de 3 de novembro de 2015.